Winter has already set in and the markets are flooded with the colorful fruits and vegetables from the December harvest. There is a plethora of the fresh vegetables and fruits that are available in the markets – avocado, broccoli, cauliflower, sweet potatoes, grape fruit, pears, spinach, beans, and so many others. 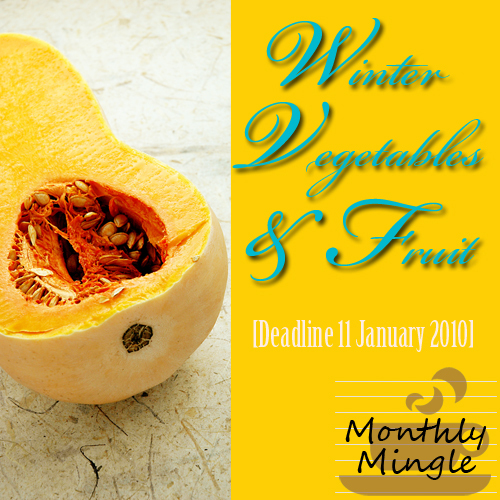 So if you have any recipes having these fruits or vegetables as the main ingredients then go ahead and rush in your entries for this month’s edition of Monthly Mingle: Winter Fruits and Vegetables. Along with these winter harvest as the main ingredients the recipes may have other vegetables or non-vegetarian ingredients. (bengalicuisine[at]gmail[dot]com) between 24th December 2009 and 11th January, 2010. 1. Create any dish between now and 11th January, 2010 that fits the idea of Winter Fruits and Vegetables. There is no limit to the number of entries you can send for the event. 2. Your creation should be prepared for the current Monthly Mingle theme and cannot be shared with any other blog events. 3. You must provide a link to this post and the official Monthly Mingle page. We would appreciate if you can kindly use the logo of the event. If you have any queries please drop a comment here or mail us at bengalicuisine@gmail.com. Lovely article….the style of article you post is quiet nice. Hi! I just want to state that I really like all your posting style and that so I am going to visit your blog regularly from now on 😉 Keep writing! Thank you so much for your comment. Would love to see more comments here at CLB. Just sent you my entry ! Thanks for hosting. .-= tigerfish´s last blog ..Kale Winter Vegetable Soup of the Day – with Salmon and Tofu =-. mailed u my entry right now. Is the deadline 11 Jan or 14 Jan? There’s a bit of confusion there. .-= Quinn´s last blog ..Granola =-. Sorry for the confusion, its 11th Jan.
Pingback: Apple Cranberry Oat Crumble « the taste space – steam, bake, boil, shake!